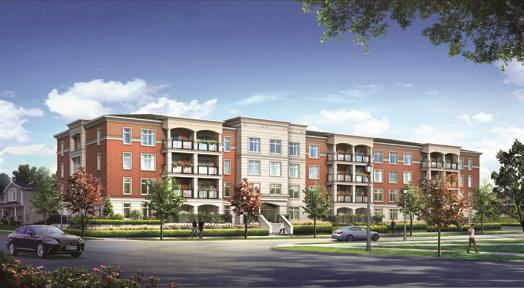 Looking for a home in Kitchener? Williamsburg Walk has lots to offer both inside and out, thanks to its spacious suites and hard to beat location. Best of all, the condo community by Reids Heritage Homes and RBJ Schlegel Holdings Inc. will be kicking off construction soon. Located at 325 Max Becker Dr., Williamsburg Walk will take shape in the heart of Williamsburg Town Centre. The complete, master-planned community features a pedestrian promenade plus shops, restaurants and other services that make living in this corner of Kitchener oh so convenient. In fact, there are 30 unique vendors located within the centre, all within walking distance from your front door. Great for commuters, the community also has easy access to Highway 85 and the 401, making getting in and out of town a breeze. That sense of ease is also present in the condo itself. Residents will enjoy maintenance-free living – no snow to shovel or gutters to clean – in an intimate, four-storey building. Whether you’re looking for a one-bedroom suite or a three-bedroom unit, the residences are spacious, ranging in size from 639 to 1,106-square feet. Buyers will have plenty of opportunity to customize their homes with various style choices available for the engineered hardwood flooring, cabinetry, granite countertops and more. Plus they’ll also snag a five-piece appliance package with purchase too. Want to learn more about the project? Be sure to check out the sales centre, situated at 325 Max Becker Drive, Unit 101. It’s open Monday, Thursday and Friday from 2pm to 7pm and weekends from noon to 5pm (additional times also available by appointment). Suites start from the low $200,000s. For more information contact 519 742 4004.